The Government has published its Action Plan for Jobs (APJ) 2018, which is the strategic plan for job creation aimed at meeting the long-term, sustained goals outlined in ‘Enterprise 2025’. The 2018 plan builds on the progress achieved by past APJs and continues to support cluster development with Geoscience Ireland outlined as a successful case study (GI Case Study). Since the first APJ was launched in 2012, over 312,000 jobs have been created in Ireland. Strategies such as developing globally competitive business clusters; enhancing cooperation and coordination between government departments; stimulating regional economic development; promoting research, development and innovation (RDI); and diversification in export markets have allowed Irish companies to both sustain themselves and scale in recent years. Geoscience Ireland (GI) is a business development cluster of over 30 Irish companies sponsored by Geological Survey Ireland (a division of the Dept. Communications, Climate Action & Environment), and supported by Enterprise Ireland and the Dept. Foreign Affairs & Trade. GI targets natural resources and infrastructure development projects in over 50 international markets and has a strong research and development component also. Since its inception in 2012, GI Member Companies have created over 750 net new jobs in the sector, employing over 3,300 people (of which over 1,900 were created by small and medium-sized enterprises (SMEs)) and generating over €800 million in turnover. The Geoscience sector is important to Ireland, a recent independent study valued the overall economic impact of over €3 billion and employing 24,700 (2016 report). An Taoiseach, Leo Varadkar TD, outlines Ireland’s need to “focus on market diversification as well as increasing competitiveness, productivity and innovation …(with) balanced regional development an ongoing and significant priority”. The objectives of the APJ include increasing exports by Enterprise Ireland firms to €26 billion by 2020, increase exports to the Eurozone by 50% by 2020, diversify export markets and support UK exports. In preparing for Brexit, GI aligns itself with Enterprise Ireland’s approach of supporting its members which are embedded in the UK economy following years of successful and sustained business, while also assisting members which wish to target opportunities in new markets. Last summer, in its annual survey, GI Member Companies (SMEs) reported 44% of revenue was generated in overseas markets including the UK, sub-Saharan Africa, the Middle East, North America, Eastern Europe, and the Nordics. Stimulating development in Ireland’s regions, increasing participation rates, meeting skills needs and boosting innovation, productivity and competitiveness are also key components of the Plan. It lists a number of strategic metrics including the creation of 200,000 additional jobs by 2020, of which 135,000 will be outside Dublin. In 2017, GI member companies reported that 60% of new jobs created were outside Dublin with Galway and Kildare leading the way. With the advent of companies collaborating and developing business in a cluster dynamic, Enterprise Ireland’s Regional Enterprise Development Fund – a key initiative in support of the Government’s ambition to create these 200,000 jobs – will support significant industry clustering initiatives. Boosting innovation remains a strategic objective of the Action Plan. In Ireland, and internationally, RDI is a core spoke in cluster development and it facilitates SMEs evolving in a manner where they can access markets with new technologies and innovative practices. Since 2014, Ireland has won €475 million from Horizon 2020, and identifies Science Foundation Ireland (SFI) and industry-supported research centres in “delivering research excellence through collaboration”. The Irish Centre for Research in Applied Geosciences (iCRAG) has recently secured €4.7 million funding from SFI to advance geoscientific techniques and technologies in Ireland, and GI sits on iCRAG’s Technical Advisory Committee. GI announced earlier this year that it is a project partner on a pan-European project: ‘Geo-Energy for the 21st Century’ (GEO-ENERGY EUROPE). This collaborative project is aimed at assisting SMEs in accessing commercial geothermal energy projects and is funded by the European Commission’s Competitiveness of Enterprises and Small and Medium-sized Enterprises (COSME) programme. GI and Geological Survey Ireland are also working with IT Carlow and SOLAS to develop a new Geo Driller Apprenticeship Course. 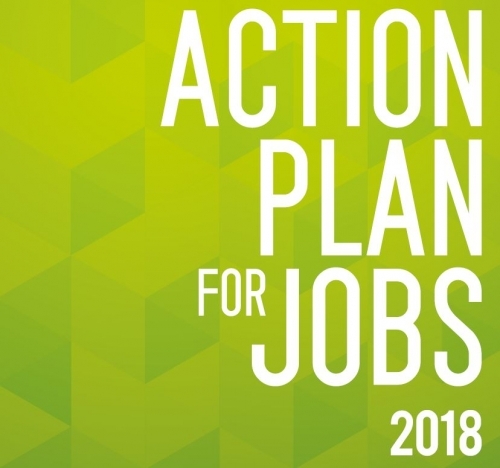 You can read the Action Plan for Jobs 2018 here.